Some of you may remember the Catskills of the Midwest exhibit that the Historical Association of South Haven (HASH) put on in 2005. Because of popular demand HASH decided to display the exhibit up again this summer. In conjunction with the HASH exhibit, HASH and the First Hebrew Congregation are sponsoring a joint event on Sunday, June 26th. A brunch at the Historical Association from 11 a.m. until 1 p.m. Klezmer music performed by the Klezmedics, will be featured, along with dessert at the shul from 12 p.m. until 3 p.m.
For those who keep kosher there will be special lunch boxes prepared in our glatt kosher kitchen. At 3 p.m. there will be a trolley tour of the Jewish resorts. The cost of the entire event will be $10. Free trolley rides will be available between HASH and FHC. Advanced tickets are available at Lakeshore Paint & Glass on Broadway or at HASH on 355 Hubbard St. and those wishing to make a donation to off-set the exhibit costs may call HASH at 269-637-6424 or by emailing hashlibrary@yahoo.com. 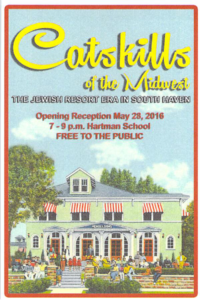 This entry was posted in Events and tagged Catskills, Jewish history, South Haven on May 18, 2016 by LH.